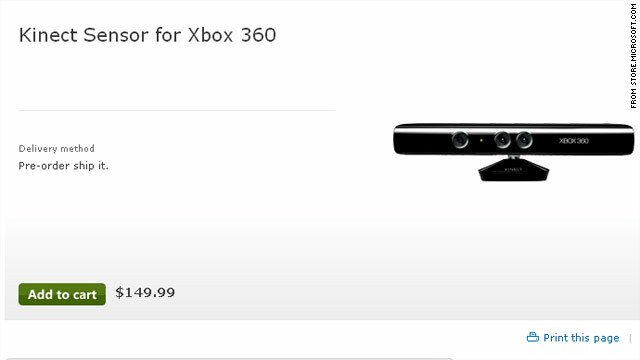 This page at Microsoft's online store was updated to say the $149.99 price for Kinect is an "estimate." (CNN) -- One day after a price was "announced" at the Microsoft online store for its new motion controller Kinect, the company added an explainer and appeared to soften its stance on the cost. Microsoft never announced a price during Kinect's E3 rollout last week, but shortly after its press conference, the online game store GameStop had the Kinect listed for pre-order at $149.99. That page was quickly pulled, and Microsoft insisted that a final price for the new Xbox 360 controller had not been determined. But on Tuesday, a price for the gaming system, which has no handheld controller and uses a camera to read the player's movements, was posted on Microsoft's online store. By Wednesday, the Kinect order form had been changed to make clear that the official price has still not been finalized. "Official pricing has not been announced. $149.99 is an estimate only and subject to change," the site reads. "Quantities may be limited. Orders will be fulfilled on a first in first served basis." A Microsoft representative did not return a message seeking to verify the price or find out how many pre-orders had been placed at the $149.99 price. The order form also includes details about the hardware players will need to have to use the Kinect.